How To Lose Weight With Smoothies - Your Ultimate Guide and Recipes! Does it seem like your busy life makes losing weight difficult and fueling unhealthy choices? I used to feel like that too… I mean, who has time to cook and eat the “healthy way” we know we should? and how can I be at my best when I'm constantly feeling hungry? Avoid spending lots of precious time on prepping, cooking and even on eating! When I discovered that I could save time using homemade smoothies, and how I can lose weight with smoothies, it opened the door for me to shed extra pounds easily. ​Without those sugar cravings, without feeling constantly hungry, and… I never saw my old weight again. Today I’m going to share my smoothie fat burning diet plan and recipes, that could fit easily into your busy lifestyle. … and they’re delicious, too! I've also discovered recently that there's a complete, easy-to-follow plan and personal coaching called "The Smoothie Diet" by health coach Drew. Wish I've known about this one during my years of struggle with excess weight! A beverage you can make at home, combining ingredients that are perfectly to your taste while being low calorie and rich in healthy nutrients. If you’re on a quest to slim down or maintain a healthy weight, then the typical contents of your smoothies should be 2-3 cups of vegetables or packed leafy greens and 2 pieces of fruit. The quantity of vegetables should always be larger than the fruits. Making a smoothie that's dominantly fruit means it would contain too much fruit sugar (fructose) which isn't diet-friendly! In this guide we’ll show you exactly what fat busting ingredients are best to use and what to avoid. You’ll also get our own personal smoothie recipes to help you get started. Drinking smoothies isn’t a magic bullet guaranteed to drop pounds of fat. I’ve seen it again and again, how great results rely on combining good nutrition, enough exercise, and proper rest and relaxation. You choose the ingredients so they perfectly cater to your taste. The result is you’ll enjoy them and want to continue with this healthy habit. A “nutrient-dense” food is packed with micronutrients while being relatively low in calories. Since your cells crave nutrients, drinking nutrient-dense smoothies can help reduce appetite. Keep in mind that not all smoothies are created equal… if you prepare a smoothie that has high sugar ingredients, it will mess with your energy and your fat-loss goals. Smoothies provide a rare opportunity to enjoy extremely delicious food while eating healthy and supporting your weight loss efforts. 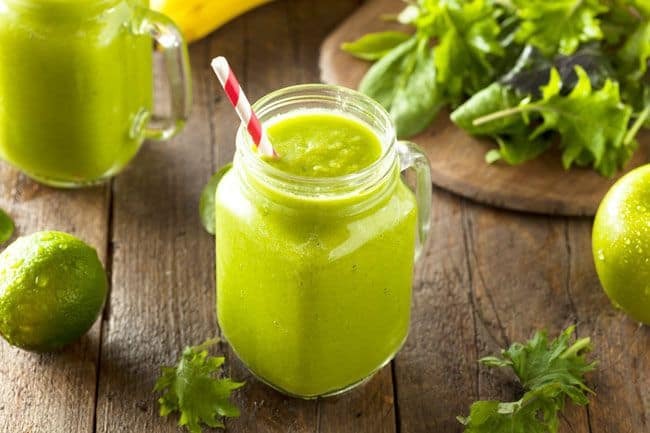 For example: if we are challenged by the taste of a healthy ingredient such as kale, a great way to mask its taste is combine it in a smoothie. I believe we should thoroughly enjoy our healthy nutrition and feel that we're only eating food that's delicious to our taste! Also, many confuse smoothies with juices, and it is important to understand the difference, and to stick with smoothies if you want to lose weight more effectively. Including vegetables in the smoothie is part of the secret of fat loss, as you’ll see in a minute. Keep reading for my top 14 fat-burning smoothie ingredients, and 7 high sugar ingredients to avoid. Have you tried “diets” which require lots of food prep, time to eat, and carrying containers of food with you all day? 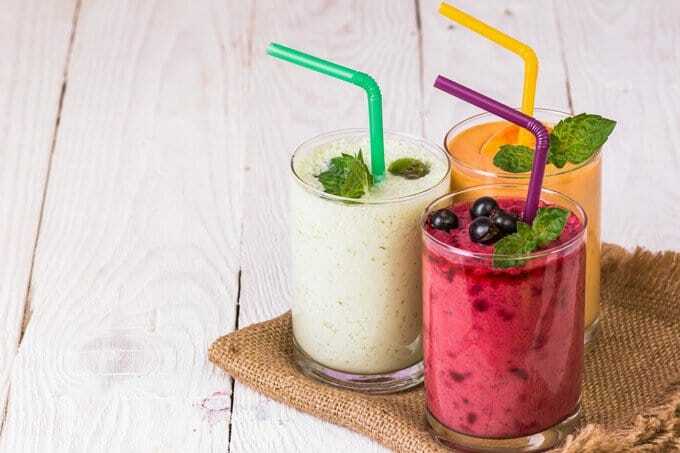 Most people can’t sustain the work it takes to eat healthy every day, but blending a couple smoothies to drink throughout the day is very practical. No stove-top required, and you won’t need a 30 minute break to chew through a giant salad. In fact, if you don’t like salads, you’ll never need to eat a salad again. I can tell you that when I learned how to make tasty green smoothies it finally open the doors for me, to eat vegetables in the quantity I needed, and actually enjoy it! We are surrounded by toxins and contaminants - in our food, water and hygiene products, to name a few. Unless our daily nutrition is rich in raw vegetables and fruits and low on processed food, then our body finds it extremely difficult to get rid of these toxins. In fact, these pollutants and toxins are attracted to our body's fat cells and stored there. As we're exposed to more toxins, our body tries to protect our organs from the toxins by producing more fat to store them! When you cleanse your body to get rid of toxins, you stop this process of producing more fat, so the question now is - how to it in an effective, healthy and easy way? A smoothie made of fresh veggies and fruit is great way to do it, and relieves you from the need to use dubious methods such as starvation cleanses or detox supplements. An easy to make homemade smoothie is what your body needs to be able to use its ability to detox itself effectively. A shake is a low calorie beverage, usually thinner than a smoothie and comes in flavors such as vanilla, chocolate or peanut butter. It’s almost always high in protein, to help you feel fuller for longer to minimize binge eating. The idea sounds great - replace a high calorie meal with a low calorie shake. Going for a store-bought meal replacement shake powder is usually not the healthiest choice. It contains highly processed ingredients and loaded with added sugar or artificial sweeteners. 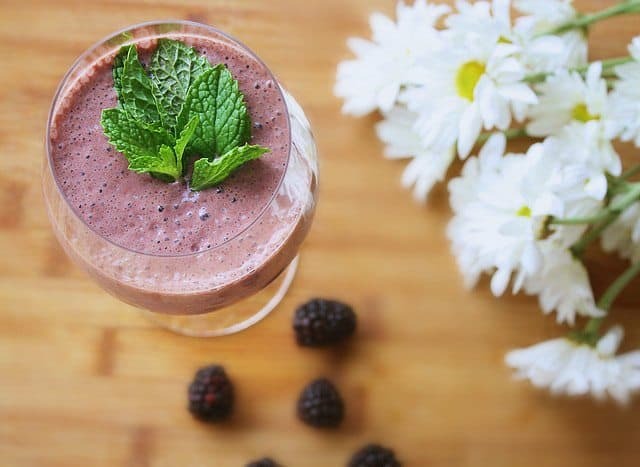 You can easily make a shake at home using fresh vegetables and fruit, while adding protein powder with your preferred flavors such as vanilla or chocolate. My favorite is Sunwarrior, which is vegan and naturally sweetened with Stevia. So you’re ready to kick-start this journey, but you aren’t sure where you start? We too had enough of those "diet plans", so this meal plan is more of an exercise to help you ease into healthier nutrition habits. For the actual recipes used in this meal plan, click HERE to download our free recipes ebook. Important! Always consult your physician or Registered Dietitian before starting any diet or changes to your nutrition. Let’s start by visualizing where we would be in the near future: enjoying 1-3 delicious smoothies every day, some of our fat already gone and the rest is on its way out. Most importantly, we have a new habit that helps us keep body weight as we like it. ​But to do that, we need to start in baby steps. We’re not starting a “diet” here. Been there, done that, no thank you… Therefore, we can’t just make a drastic shift in one day, or else it would end up like all those other “diets”. We will start with breakfast, as most people find it easiest to start this new eating habit with. 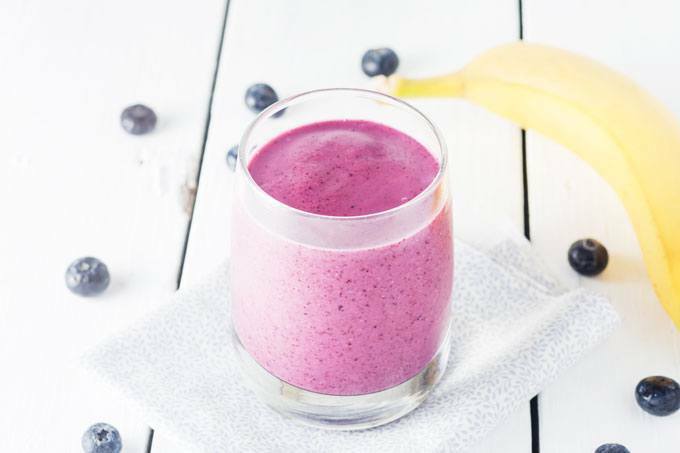 Incorporate a breakfast smoothie into your morning routine to start feeling amazing. Download my recipe book for the exact recipes you can use to make delicious breakfast smoothies. 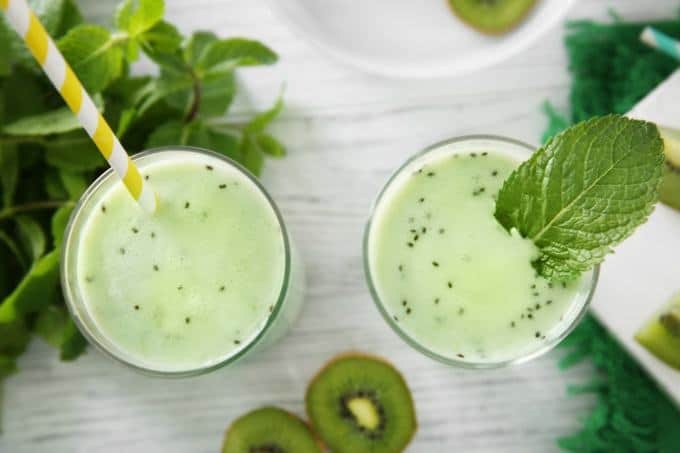 Rotate between the different breakfast smoothie recipes, so you won’t get bored, and also have the chance to discover what kinds of smoothie tastes you like best. In the next few weeks, gradually swap unhealthy snacks like chips, crackers and candies with a snack smoothie (recipes inside the ebook), nuts or freshly-cut fruits. Now that you’re used to having a smoothie for breakfast, you’re going to start having one for dinner as well. Don’t worry, you don’t have to drink the same smoothie twice – see the recipes ebook for dinner smoothie recommendations. By now you will be getting into the groove of good nutrition, and making healthier choices naturally. Another important change that starts to take place now is that your taste buds start to get used to the taste of greens. During this week as well, be sure to rotate between different recipes for breakfast and dinner smoothies. Feel free to try different variations on the recipes or swap ingredients. Just make sure you keep the right proportion of fruits and veggies (as explained in a minute) and avoid too much sugary fruits. Remember to keep your snacks healthy, and make lunch a high protein plate with lots of veggies if possible. For the weekend, continue drinking smoothies in the morning, but lunch and dinner is up to you - if you have a family dinner or lunch at a restaurant, just enjoy it. You deserve it, after having saved so many calories and consumed so much healthy nutrients this week! By week 3, you are a blender-pro. For this week only, you’ll drink an extra number of smoothies to speed the weight loss effect, then next week return to 2 smoothies a day for the entire week (except weekends). In the example above, you drink smoothie for breakfast and dinner every day, while only on Monday, Wednesday and Thursday you replace all three meals with healthy smoothies. Since your taste buds are probably a bit more used to greens now, in between the smoothies you can snack on fresh-cut veggies like cucumber, carrots and celery with nuts or nut butter. Some low-sugar fruits like berries or peaches would also be good. On the weekend, enjoy some healthy cooked meals and maybe a dinner out with some nice wine - same as week two. Which color of fat burning smoothie would you like today? After 21 days of smoothies, this lifestyle has become a habit or on the verge of becoming a permanent, healthy habit. Now it’s time to find what works best for you so that you can continue long-term. If you have a lot of weight to lose, I recommend sticking with the Week Three plan for a few weeks. Smoothies are known as one of the most effective and fun ways to help fight those extra pounds and maintain a healthy weight. The three recipes here cover you for breakfast, lunch and dinner. They're taken from my free eBook which you can download using the green button below. What makes a smoothie recipe fat loss friendly or fat burning? Low fat: a green vegetable smoothie is by nature lowfat, though as far as taste goes you can use the tips and techniques in the guide to make it taste exactly as you love it. Having said that, including healthy fats in your smoothie would actually help with fat loss! My favorites are flaxseed, chia and cold pressed coconut oil. Timing: breakfast, snack or meal replacement - consuming a smoothie as your breakfast is a proven way to feel fuller for longer, avoiding hunger pangs, avoiding snacking and larger lunch portions. Replacing one other meal with a healthy smoothie would also mean your'e getting a nutrient-rich meal but without the extra calories. 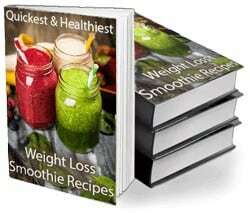 Do you want to get ALL my original smoothie recipes for weight loss? click the button below to download them (it's free). This smoothie tastes just like a blueberry muffin thanks to the addition of oats – a classic breakfast food. And yes, you can eat raw oats! They are a great low-glycemic complex carbohydrate. 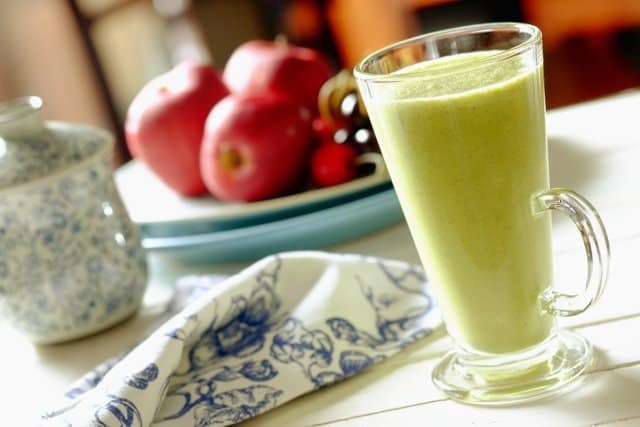 ​Drink this delicious morning booster right away or store in a travel cup for later. It can keep well in the fridge overnight so you can make ahead for a grab-and-go breakfast. Blend until completely smooth. This may take 1-2 minutes depending on your blender. This smoothie packs some of the most nutrient-dense foods on earth into a single glass. If you’re trying to lose weight, make this smoothie for lunch at least a couple times each week. Drink right away or store in a travel cup for later. 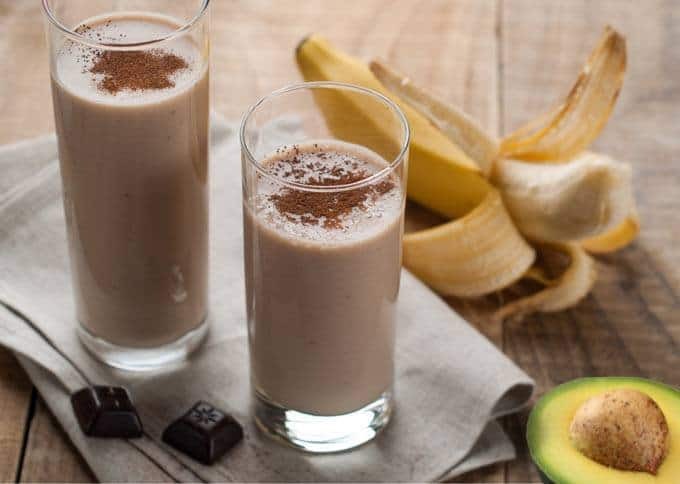 Avocado and cacao powder combine to make a rich smoothie, so decadent you won’t believe it’s healthy! Add all ingredients to blender jar and blend until smooth. Drink right away and enjoy! We’ve put together this comprehensive guide to help you quickly get started and be on the right track. Read on to learn what ingredients are good to use, what to avoid, as well as our tips, tricks and ideas for perfect, delicious smoothies. The basic appliance you’ll need in order to make these smoothies is a blender. There are different types of blenders, but the ones that are easiest and quickest to use, while giving you the smoothest beverage texture, are either bullet blenders or high performance blenders - see our full guide to blenders here. The following ingredients have been scientifically proven to help lose weight, and so should take an important part in your smoothies. Other ingredients can be more challenging to your taste buds, such as kale and cucumber. You'll notice quite a few vegetables here, which qualify these beverages to be called "green smoothies". 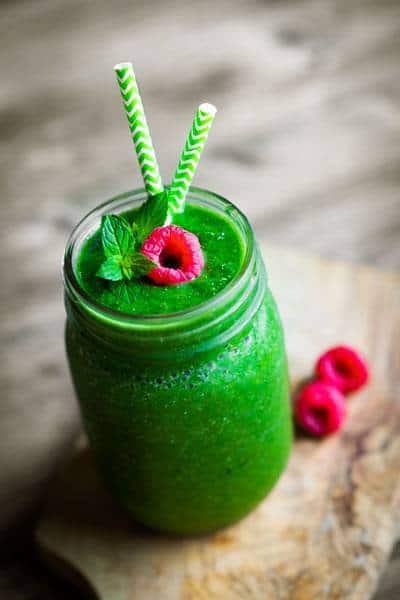 Green smoothies are the most suitable type of smoothies for our purpose, though they don't necessarily have to bee colored green or taste like vegetables - the color changes according to the other ingredients, such as blueberries, and the veggie taste can be muted by the fruits or other condiments you add. 1. Coconut milk: high in healthy fats, coconut milk will keep you full for hours thanks to the satiating effects of dietary fat. Coconut milk will also add richness to your smoothie so you can enjoy making healthy choices. 2. Avocado: packed with fiber, monounsaturated fat, potassium magnesium and more, avocados are one of the healthiest food around. They are also extremely low in sugar, and give a creamy texture to your smoothie. 3. Cucumber: increase the hydrating effects of your smoothie by adding cucumber! High in water and vitamins, but low in calories it is the perfect ingredient to keep you full and lean. 4. Kale: incredibly high in antioxidants, fiber, calcium, minerals, and even protein… kale is an absolute super food that you should be adding to your smoothies. It’s also very easy to disguise the flavor of kale, so your smoothie will still taste amazing. 5. Spinach: spinach is the mildest green to incorporate into smoothies, so most people can add 2-3 cups without noticing the taste. This is great because spinach is rich in iron, vitamin C and fiber. 6. Ground Flax: high in omega-3s, fiber and lignans, flax seeds are known to be effective at treating obesity and digestive disorders like constipation. Grinding the flax helps you to absorb more nutrition, so don’t skip this step. 7. Chia seeds: similar to flax seeds, chia seeds are a great source of omega-3 fats and dietary fiber. Chia seeds are also a good source of plant-based calcium, which may be helpful for those suffering from lactose-intolerance. 8. Hemp seeds: known for being higher in protein than most seeds, hemp hearts can increase the satiety-factor of your smoothies by keeping you full for hours. 3 tablespoons of hemp seeds contains 10 grams of plant-based protein, so they are worth having on hand. 9. Coconut Oil: contains medium-chain triglycerides (MCTs), which encourage fat burning and can help with weight loss. Coconut oil also helps to keep you full thanks to it’s high-fat nutrition profile. 10. Berries: of all fruits, berries are considered to be the most nutrient-dense. This is thanks to their high antioxidant and low sugar content. 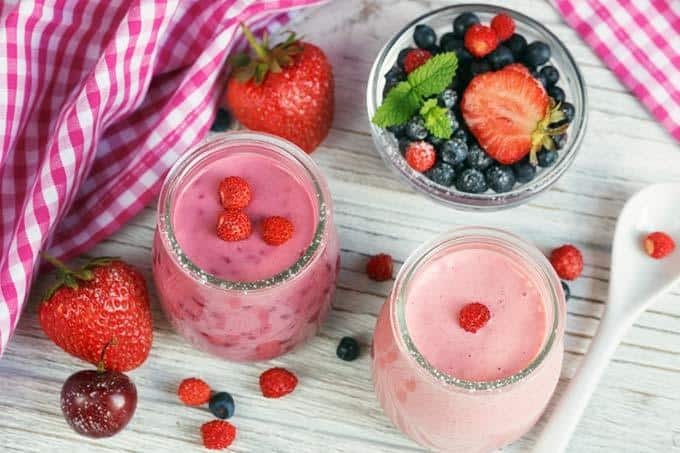 Berries are my top choice for fruits to use in smoothies because they will not raise insulin, therefore they will not contribute to body fat as much as other fruits. 11. Banana: unlike berries, bananas actually contain quite a bit of sugar. However, this doesn’t make them necessarily bad. Bananas are rich in potassium, an important electrolyte for muscle and cardiac health. To keep the sugar low, limit your bananas to just one per smoothie, and time it after a workout for best results. 12. Pineapple: rich in the digestive enzyme bromelain, pineapple can help improve your digestion by breaking down food more effectively. 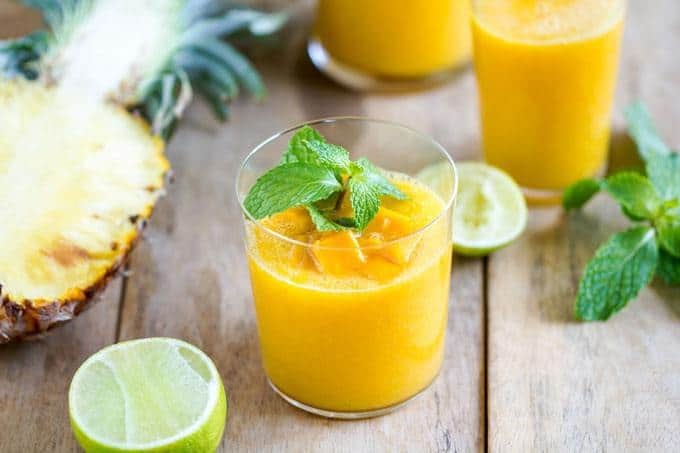 If you’re prone to gas, bloating and belching after drinking smoothies, try adding pineapple to relieve your symptoms. 13. 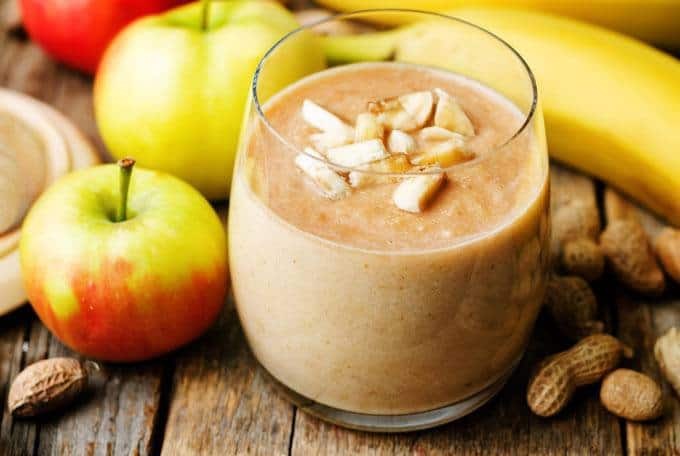 Nut Butter: not only are they a great way to add creaminess and healthy fats to your smoothies, nut butters also reduce your risk of type 2 diabetes. Since they are a source of protein but very low in sugar, nut butters add the right type of nutrition to your smoothies. 14. Protein Powder: protein powder is a supplement that can take your smoothies to the next level. Adding around 20 grams (or more) of protein per serving, protein powders keep you full and help your build more muscl﻿e. As a bonus, most veggie protein powders are sweetened with stevia and can improve the flavor of your smoothie. The one I use is the Sun Warrior vegetable protein powder. 1. Dates: while they are not necessarily an unhealthy food, dates are extremely high in sugar. Adding dates to a smoothie along with other fruits like bananas or berries can take the sugar content far from what is recommended. 2. Green tea: use it as a great low calorie base to your smoothie. For an extra boost of antioxidants, fat burning metabolism and a possible decrease in the “bad” LDL cholesterol, Matcha green tea is especially effective. 3. Unsweetened cocoa powder: researchers have found cocoa to help reduce the stress hormone cortisol. This is great for our purpose, since cortisol promotes the storage of fat, especially around the belly. 4. Cinnamon: it gives a great flavor and even some sweetness, without adding calories. Cinnamon also has a host of other health advantage, so it is definitely one of the top recommended smoothie condiments. 5. Ginger: found to increase metabolism for better fat burning, and it also improves digestion. 1-3 teaspoons of grated ginger should be enough. 6. Apple cider vinegar: researchers found that it can lower blood sugar levels, and can help if you have type 2 diabetes or you’re at risk. 2. Skim Milk: dairy products have been associated with reduced insulin sensitivity. Insulin is your storage hormone, so if you don’t want to gain fat you should aim to improve your insulin sensitivity - so your body will make less of it, and thus be less inclined to store fat. In short, either avoid dairy products as the liquid basis of your smoothies, or use only a small quantity. 3. Agave Nectar: although it might appear as “healthy” thanks to its lower GI (Glycemic Index) score, agave nectar is not highly recommended. Similar to high-fructose corn syrup (HFCS), agave nectar is loaded with fructose. Fructose has been associated with higher levels of VLDL cholesterol (the worst kind) and increased belly fat. 4. Coconut Sugar: while it is a lower glycemic sugar option, coconut sugar has little place in your smoothie. Like dates, it adds unnecessary sugar to your smoothie, which can take away from the overall healthiness of the recipe. 5. 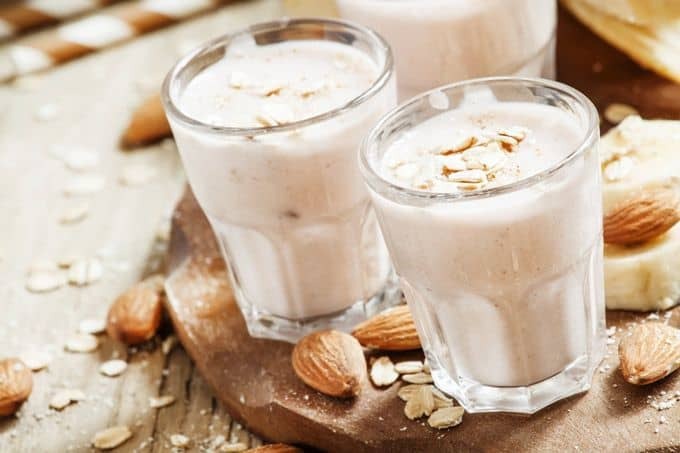 Flavored Almond Milk: when buying non-dairy milk, always ensure it is unsweetened. Usually the chocolate and vanilla flavors contain a lot of added sugar which will only make you fatter and hungrier. 6. Maple Syrup: maple syrup can be a good source of minerals, but when it comes to your smoothies – leave this ingredient out. If you need a sweet taste in your smoothie, try adding stevia. 7. Sweetened Peanut Butter: even though peanut butter can be high in healthy fats and protein, some brands of peanut butter contain icing sugar and hydrogenated oils. These ingredients can sabotage your health, even if you think you are choosing a healthy ingredient. 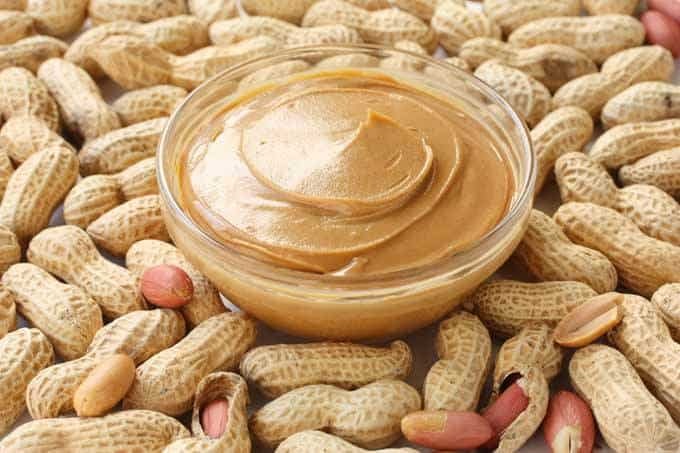 Always choose peanut butter labeled as “natural”, and have a quick glance at the list of ingredients, to make sure it contains only a single ingredient: peanuts. When you’re making a smoothie, use a maximum of two kinds of fruit to avoid overloading your smoothie with sugar. I recommend choosing only one high-sugar fruit and combining it with a low-sugar fruit. Load your smoothie up with at least two large handfuls of greens and you will give yourself the best possible chance at losing weight. Fats are essential to keep you full, they help your body absorb nutrients and keep your skin glowing. Since you need to cut back on calories, the best way to eat less and feel full is to make the smoothie thicker. Researchers discovered that thickening a drink makes people feel fuller, regardless of how many calories the drink has. Therefore, it’s a great idea to prepare a low-calorie smoothie and thicken it using one of the methods found here. Chia seeds have this fun feature that they swell when soaked in water for a few minutes. 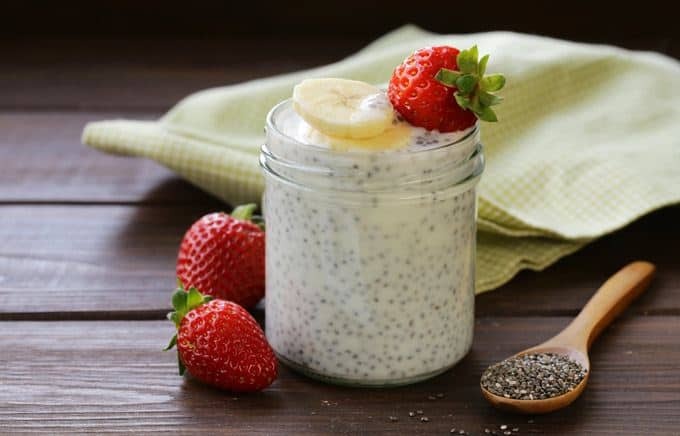 What you can do is add 2 tablespoons of chia seeds into your smoothie before drinking it. Chia takes about 20 minutes to fully swell, so it will happily swell up in your stomach and leave you feeling full for hours. omega-3, protein, fiber, calcium and super high in antioxidants. Wanna make your smoothie richer in flavor without adding calories? Add spices or fresh herbs. Experiment with what you have at home or find in the store. Good chances you'll get surprisingly yummy results. If you try to reduce your calories too drastically, you will increase your hunger and eventually binge eat. ​Remember that your willpower is a finite resource and if you want to lose weight and keep it off, you need to get proper nutrition. All the smoothies in the recipes ebook here are designed to support your weight loss efforts, without containing too few calories. Are you ready to lose weight and improve your health with smoothies? I drink a smoothie every day to stay lean and healthy. I usually make the recipes you’ll find in the ebook, although I now do variations and play more with superfoods such as Maca. What do you think about this plan? Have any questions you’d like to ask me? How to lose fat and keep a healthy weight by using delicious, natural homemade smoothies! Why does it seem like everyone is having smoothies in the morning? Is there any disadvantage to drinking a smoothie instead of dinner? I’ve always heard that it is not healthy to eat late at night. Wonder if it would be less effective for losing weight? Thanks for your message. You can freely consume a smoothie in the evening as part of your weight loss efforts. According to the U.S. Department of Agriculture Weight Control Information Network website: “it does not matter what time of day you eat. 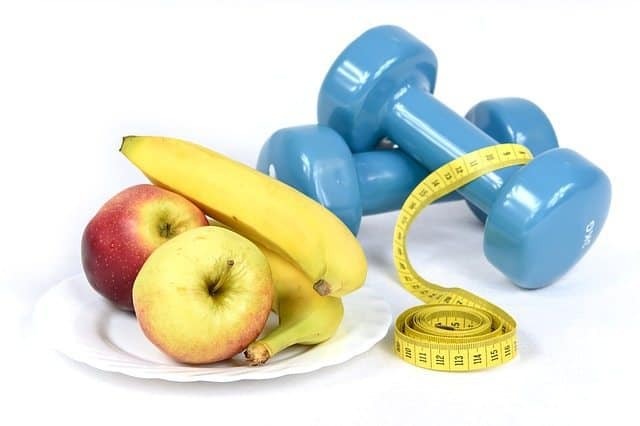 It is what and how much you eat and how much physical activity you do during the whole day that determines whether you gain, lose, or maintain your weight.”. So, if it’s a dinner replacement then no problem. However, eating late at night is generally not recommended as it might disturb digestion and sleep quality. Due to my disability I felt unmotivated however after reading your guide I can’t wait to try it! thank you! Hi Sharon, I’m so happy to hear that this post has motivated you! I’ve found that one of the greatest appeals of smoothies is that it’s enjoyable to drink, while providing nutrients and supporting weight loss. Please keep us posted on your progress. good luck! Thank you for the information and guidance. My blender is ready to go! I’ve heard many replace some of the liquid with ice to make the smoothie more refreshing cool. My tip is to use frozen fruit instead of adding ice. so instead of the ice diluting the taste of the smoothie, there’s more taste with the same liquid. thanks for the useful article. Absolutely! Thank you for the tip Deborah. There’s a lot of folks that I think would really enjoy yyour content.